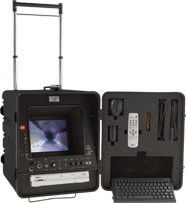 The Ratech PMV© model has quickly become one of the most accepted systems in the market today. The design features a 10" LCD COLOR display & separate built-in DVD Recorder making future repair or replacement a snap. Two models are available - Model PMV-C featuring a full spectrum miniature color camera head measuring only 1.375" diameter coupled with a highly sensitive CCD chip and 16 high intensity LED lights. Model PMV-BW is a high resolution black and white system, color ready, that features a camera head (0.5 lux) capable of providing excellent black and white pictures in low light conditions. With it’s built in hi-intensity LED lighting, the camera can easily be used in 2"-10" lines and sometimes larger depending on pipe conditions. The cable reel is supplied standard with 200' of Gel Rod™ push cable (other lengths available) on a lightweight yet rugged steel frame featuring a noise-free slip ring assembly.